To be eligible you must be age 18 or over. Only completed installations will result in payment. Payment will not be made until after the installation is fully installed and in operation. Your referrals must be deemed Qualified Individuals to be eligible. Qualified Individuals must be at least 18 years of age and reside in New York State. Referrals must be new contacts only. Existing known Nickels Energy Solutions, LLC. contacts will not be considered qualified referrals. Referring individuals can not refer themselves nor anyone living in the same household. 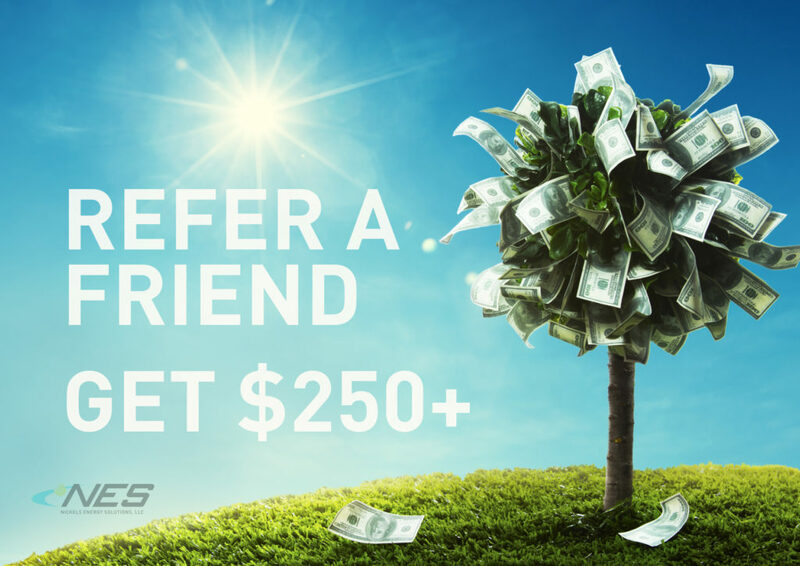 For each Qualified Individual that completes a solar system installation on his or her home pursuant to a contract with Nickels Energy Solutions, LLC., the referring individual will receive U.S. $250.00; limit one per household on which a photovoltaic (PV) system is installed. PV installation must be completed within one year of referral submission in order to qualify. Nickels Energy Solutions, LLC. reserves the right to change or discontinue this promotion at any time in its sole discretion and without notice. Terms and conditions apply, and not every individual will qualify for PV system installation. This is a limited time, non-transferable offer and cannot be combined with any other offer. Referring individual is responsible for any and all tax reporting and liability related to any “Rewards” (cash payments). Payments exceeding $250.00 will be determined on a case-by-case basis.